What are Disconnected Logins in Sage 200cloud and how do I get rid of them? We hate disconnected logins in Sage 200cloud too! One of our most common support call queries is about disconnected logins. The user will get an error message advising that they are unable to access part of the system. This error message states that the user is”Unable to access the SOP module feature ‘SOP Settings’ because you are currently accessing the SOP module feature ‘Enter New Order Full’“. You can get variations of this error message where it’s another user accessing the system or they are using a different module. If this error is occurring and you believe that the user is not currently accessing that module, then the other reason could be disconnected logins. The first thing to check would be the User Login Status window. Users can experience this error message if they have been thrown out of Sage 200cloud or if they have had to crash out of the program with a window still open. Windows that were still open at that time will be locked for future users. This prevents anyone from making any changes on the screen. How do you remove the Disconnected Login? 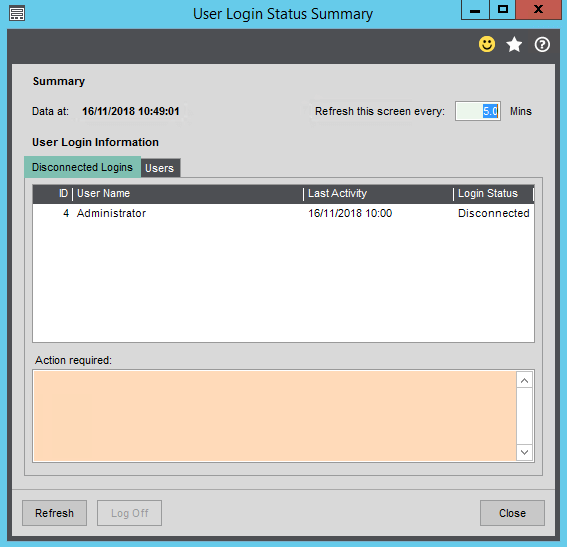 To remove the locked window of a disconnected login you need to go into Accounting system Manager > System Utilities > User Log in Status. This will show a list of any disconnected logins as shown below in the screenshot. By clicking on the login and then selecting ‘Log off’ this will remove all related locks. Don’t worry, these are old sessions so won’t affect users that are currently logged into the system. Do you have multiple disconnected logins? Hold the Control Key on your Keyboard and select the multiple Logins, this allows you to log off more than one account at a time. Home » Sage Blog » All Sage Blog Posts » What are Disconnected Logins in Sage 200cloud and how do I get rid of them?